exhaling breath as sweet as sleep. I found Cindy Jenson-Elliott’s words surprisingly lyrical (I say “surprising” because when my kids were little, I plowed through my fair share of children’s books that were anything but lyrical.) Read out loud, Cindy’s prose flows with a natural rhythm that will appeal to listeners of any age. While the body of the book is written with younger kids in mind, the last four pages are a compendium of common weeds that is full of interesting tidbits (and includes botanical names). Even adults will learn something—for example that Spanish monks scattered wild mustard (Brassica campestris) seeds along the road between the California missions to make it easier for them to find the way. Today, wild mustard grows all over California and is one of my favorite harbingers of spring. Weeds Find a Way was published by Beach Lane Books and is available from the usual channels, including Amazon. My kids are too old now for this book so I’ve decided to raffle it off among my readers. If you’d like to participate, please follow the instructions in the Rafflecopter widget below. Please note that this giveaway is for U.S. residents only. Shipping the book overseas would be cost-prohibitive. Fellow garden blogger Alan reviewed Weeds Find a Way on his fantastic blog, It’s Not Work, It’s Gardening. Click here to read his review. dang I wonder why I didn't get one! That is so cute! I love it and I have a new little nephew that would love to have this book! Fingers crossed! Thanks so much for reading and reviewing Weeds Find a Way! 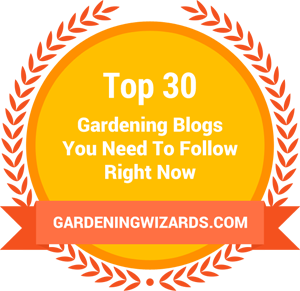 I love our blog -- I learn so much about gardening in an informal and very palatable way from blogs. I also blog my garden and nature adventures with kids and at home at http://naturexplorer.wordpress.com. Our school garden blog is also a fun way to check out how our school uses the garden to learn and grow at http:/explorergarden.wordpress.com. Enjoy your weeds! They are here to stay, so we might as well embrace them! And the winner is: Candice Suter. She is the only one who entered the raffle and left a blog post stating whom she would give the book to if she won it. Candy, I will get the book to you ASAP.